This study-referred to as a preface is given this designation because its aim is not to offer an up-to-date overall assessment Drydens translation of Virgils neid, but rather to provide a valid basis for such an assessment. In this it seeks to provide a comprehensive analysis of relevant areas (i.e. the conditions of expression) forming the very basis of the genesis of Drydens translation, and thu… s a valid understanding of the poetry (cf. R.A.Brower, Alexander Pope: The Poetry of Allusion [London, 1968], p.98). Part One provides a firsthand picture of the background out of which Drydens translation came into beingthe tradition of neid translation. 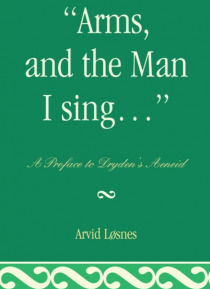 The evolution of Drydens theory of translation and his use of textual sources are discussed through a systematic presentation of the various conditions of expression involved as Dryden took upon himself to render Virgils neid into English poetry. Part Two presents the relevant aspects of Drydens conception of Virgil and essential features of the Virgilian epic with reference to the assessments of modern classical scholars and Drydens own conceptions in these matters. Various analogieshistorical, political and literaryare drawn between the respective periods in which Virgil and Dryden lived to reflect the basic similarity in conditions of expression out of which Virgils neid and Drydens translation came into being.